How old are your cash registers? Do you need modern and innovative replacements? Buy or hire the EPOS cash registers from CCM EPOS and see how your business will develop for the better with our retail cash management systems. At CCM EPOS, our aim is to simplify your sales processes through electronic tills that provide simple navigations and clear product layouts. If you work in a constantly busy environment, you will want to ensure that all your sale transactions are as smooth and efficient as possible. You may find that your current cash tills are insufficient, which will result in your team struggling to manage the customers coming to your business. In which case, our cash register EPOS systems are exactly what you are looking for. Our EPOS cash registers are suitable for a wide range of businesses from restaurants to retail outlets and much more. We are one of the leading companies that supply and fit brand new EPOS cash registers to clients in the retail and hospitality sectors. Using the latest touch screen technology, our touch screen cash tills will improve the effective management of your sales and stock processes. Should any changes need to be made during a transaction, this can be completed quickly with our touch screen retail EPOS cash register systems. Our touch screen electronic tills have been specially developed to eliminate the difficulties that are usually associated with product sales and cash taking management. When you upgrade to an EPOS cash register, you will be able to easily programme any discounts and promotions that may be on offer to your customers. Is there limited space in your store? When you don’t have room to fit our larger EPOS cash register systems, then the compact design of our OnEPOS EPOS systems are the perfect alternative. This system boasts all the benefits of our traditional cash registers while offering a simple, handheld design. While the screen may be much smaller, it still offers a fast, responsive performance to allow for speedy transactions that miles ahead of other cash tills. OnEPOS systems can also be linked to your Wi-Fi so that they can be used in all areas of your premises with no fuss. Additionally, you can mount your EPOS cash register on your bar and opt for the battery-operated alternative. Our Mobile EPOS cash registers are also handheld and portable, and therefore ideal for busy working environments. This is popular among customers in the hospitality industry as staff will be able to record orders quickly and accurately, and put them straight through to the bar or kitchen. You can also input a graphical table plan in your system, which allows for easier customer management. If your diners have any specific preferences or dietary requirements, waiting staff will be able to filter your cash tills on-screen menu and make recommendations accordingly. These systems run on PocketTouch, an advanced software than can be accessed on your iOS device, Windows Mobile, or even an Android tablet. The PocketTouch programme can be customised to suit your company and the needs of your customers. With our mobile EPOS cash registers, dispense error rates will decrease, and upselling will be easier, consequently improving the efficiency of your business. 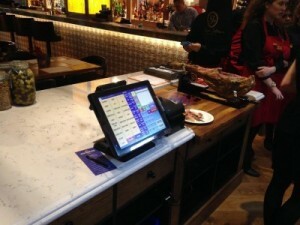 What are the benefits of using an EPOS cash register? You might think that it would be a lot simpler to stick with your existing cash tills. While this may seem like a sound decision, in fact, there are many advantages to electronic registers that make them a far better choice for the long-term success of your company. This may seem like a moot point, but even in this day and age with all the modern technology that is around, businesses are still operating older style cash registers. Unfortunately, these rely on the competence of the employees using them. One mistake could lead to a customer either being overcharged or undercharged. With an EPOS cash register, the likelihood of mistakes being made is greatly reduced ensuring greater consistency with every transaction. For any business to succeed, you must first ascertain how you’re performing and whether there is room for improvement. Nowadays, many electronic tills have a built-in feature that enables you to quickly view performance reports. From analysing daily or annual profit margins to identifying popular products, you will have a complete picture of where your company sits in relation to your targets. These reports will also help to influence your marketing campaigns. One major advantage with electronic tills is that they can be used to monitor staff activity. This means that individual transactions can be tracked to a specific individual. Companies may choose to use this information to reward colleagues with the strongest sales figures. Likewise, employees who are underperforming can also be quickly identified. A classic example of how our EPOS cash registers have assisted a company in delivering their services can be found in the heart of Boscombe. 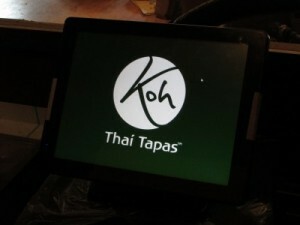 When Koh Thai approached us, they explained that they required an effective EPOS system to assist in providing their customers with an exceptional service. Here at CCM EPOS, we provided them with EPOS cash registers that were intuitive and easy-to-use. Thanks to a touchscreen that allows for orders to be quickly processed and relayed to the kitchen, front-of-house staff now have more time to spend serving the guests. Best of all, our EPOS cash registers have enabled the management and directors at Koh Thai to access up-to-the-minute sales reports as well as the means to record sales. But we went further than that with our EPOS cash registers. By providing full integration with the Cloud, Koh Thai are now able to create updated menus and adjust pricing from any location, worldwide. Koh Thai requested that our EPOS cash registers be able to expand alongside the business and we made certain that that request was fulfilled. The introduction of our EPOS cash registers has since led to Koh Thai undergoing a massive expansion. With a new brand, Koh Noi established, and six new restaurants opened, the company continues to go from strength-to-strength. This success is largely due to the intuitive systems that we supplied and the scale of the Cloud back office. Why choose CCM EPOS cash registers? At CCM EPOS, we are committed to the needs of our customers and are driven to finding EPOS solutions that are suitable for each company and their requirements. Our fantastic selection of electronic point of sales systems are guaranteed to improve the efficiency of your business and will allow you to serve more customers in a shorter space of time. When you need advice and support, our team are resourceful and will ensure that your EPOS systems are working at the highest calibre. Technology is constantly evolving, which means that EPOS cash registers are always becoming quicker, more advanced, and easier to use. This is why we only supply clients with the latest EPOS systems on the market. We can also provide a service to check that your systems are working to the best possible standard. Whenever you have any questions about maintaining and upgrading your cash registers, we are just a phone call away. Running low on vital EPOS accessories can slow down your business, but we are here to make sure you don’t run out of essential stock. In addition to quality EPOS cash registers, we also provide clients with important till supplies such as till rolls, quality inks, and EPOS parts. We guarantee next day deliveries on all orders, so even in an emergency, you will be running smoothly as normal with our service. Many small-to-medium sized businesses in the area continue to come back to CCM EPOS for their cash register needs. This is because they know that we will tailor our service to suit their business specifically. Whenever you need to replace or upgrade your existing cash registers, make sure that CCM EPOS is your number one choice. To find out more about the best EPOS cash registers on the market, get in touch with CCM EPOS on 01202 302666 or email info@ccmEPOS.com. Updated on 25th January 2017.